Seven members and two staff of KFTC are in San Francisco right now, participating in a week of climate actions called Solidarity to Solutions (Sol2Sol for short), aimed at bringing grassroots voices and solutions to the forefront during a major global climate summit that is being hosted by California Governor Jerry Brown and attended by many corporate and state leaders. 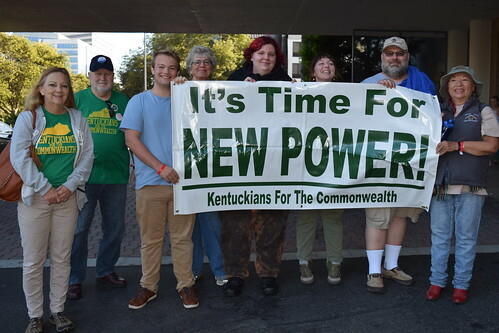 The Kentuckians are among 500 grassroots delegates organized by It Takes Roots, a collection of four important networks, including the Climate Justice Alliance, Right To The City, Grassroots Global Justice, and the Indigenous Environmental Network. The Sol2Sol week has been planned with the following goals: "To serve and be in solidarity with the leadership of communities in the Bay Area, across the state, and around the world; to challenge, expose and stop the massive subsidies being handed to multi-national corporations that are violating and destroying our families, ecosystems, and climate; to move public funds to repair, restore and protect Mother Earth and all her peoples; to end the epidemic of disaster capitalism, and redirect stolen wealth to the service, solidarity, and support of communities who are developing place-based solutions to address the root causes of climate change, poverty, and the crisis of democracy." On Saturday, the nine KFTC members joined with more than 30,000 others in a large and boisterous march in downtown San Francisco, organized by the People's Climate Movement. "I'm honored to be here," said Alexa Hatcher from Bowling Green. "Yesterday was about connecting to one another. Everyone was taking care of each other. We were marching with a single purpose and that's to build solidarity where corporations and government powers have historically worked to keep us apart. We are not fighting against each other for scarce resources anymore. We're coming together against a common enemy that has worked to keep us silent and dependent to build a better future for us all." It was 37 years ago today – August 17, 1981 – that a group of 26 people from 12 counties meeting in Hazard agreed to officially form a new organization: KFTC, then known as the Kentucky Fair Tax Coalition. "We just knew that it made sense to work together across county lines because the problems we faced were similar and needed to be addressed on the state or national level," said Gladys Maynard, who was representing the Concerned Citizens of Martin County and became KFTC's first chairperson. 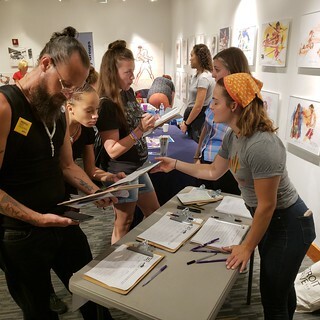 KFTC’s annual meeting once again demonstrated the power that a 37-year-old grassroots organization can bring to bear. Harnessing the people power of its near 12,000 strong members, KFTC brought together over 300 of its membership in Berea. They attended multiple workshops throughout a weekend full of training, learning, dialogue and fellowship. I want to thank KFTC for helping my husband Alvin and me keep the despair and darkness away during the last year. Last night marked our first anniversary with the Rowan County chapter. Although we joined in April at an event in Lexington, our first meeting locally was the 2017 annual meeting. We recruited four more members by September, all of whom have been active on the Democracy Team. All of us except Alvin, who will soon begin working full-time with KFTC through December, have signed up to serve on local and state-wide committees. Alvin brought a new member to the annual meeting last night, and a couple more college students are going to other chapters back home this summer, then coming to the Rowan chapter in the fall as new members. On a hot day last month, I stood in front of the state capitol building with hundreds of other Kentuckians, including many KFTC members. Members of the Perry County KFTC Chapter of gathered Tuesday in Hazard in front of U.S. Rep. Hal Rogers' office to protest the separation of families and stand in solidarity with immigrants being targeted by ICE and Customs and Border Protection. The KFTC members met with Danielle Smoot of Rogers' staff to discuss the issue of separating families at the border. They asked for a meeting with Rogers when he is in Kentucky during a congressional recess. There is a real fear that causes people from other countries to seek asylum in the U.S., Susan Hull of Perry County pointed out. "I lived in Nicaragua for three years. There are ‘the missing’ as they call them, the army comes in and then people are missing the next day. I know that it's true, but it's something that some of my friends here think is made up. There is a real fear."